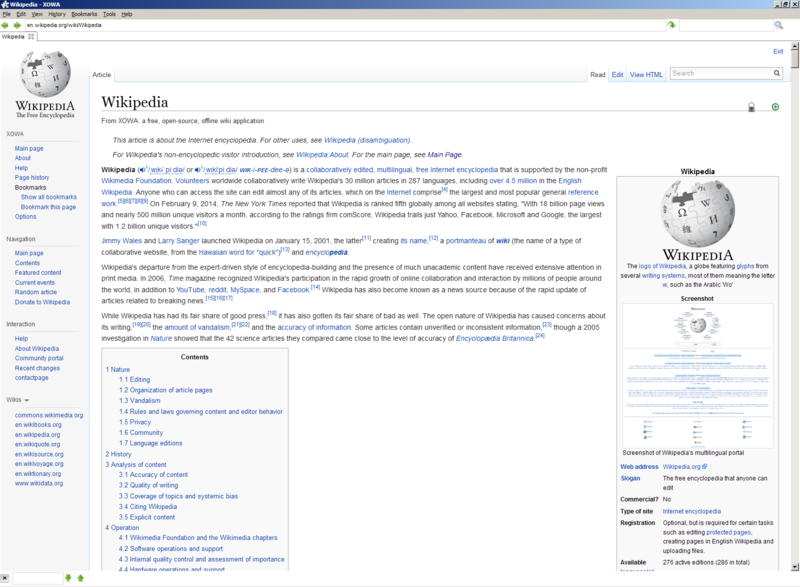 XOWA is the free, open-source application that lets you download Wikipedia to your computer. Access all of Wikipedia offline -- without an internet connection! Download a complete, recent copy of English Wikipedia. Display 5.0+ million articles in full HTML formatting. Show images within an article. Access 5.0+ million images using the offline image databases. Update your wiki whenever you want, using Wikimedia's database backups. Navigate between offline wikis. Click on "Look up this word in Wiktionary" and instantly view the page in Wiktionary. Edit articles to remove vandalism or errors. Install to a flash memory card for portability to other machines. Find a word on a page.